Everyday Carry Gear isn’t just the crap you happen to keep in your pockets or bag all the time. 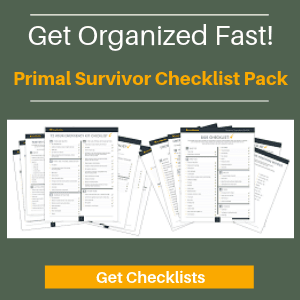 EDC is a mentality in which you make sure to always have what you need to survive – whether it be “first world” problems like a broken shoelace or a true SHTF disaster. There is a lot of EDC gear out there ranging from EDC keychain tools, EDC wallet tools, wearable EDC items, and kits. I’m not going to tell you what specific EDC items you need. 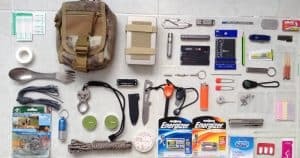 Rather, here is the EDC gear types you need for survival regardless of how the day goes! At the very minimum, keep a lighter as part of your EDC gear. But I find that smokers are really good at “borrowing” your lighter and never giving it back. Cheap lighters also fail regularly. Get a quality lighter like a zippo, or get a special purpose all weather fire starter instead. Once my boot lace broke. Cordage to the rescue! There was that time that a man forgot his keys in his car and we retrieved them through the window using some cordage tied to a bent paperclip. And there were the dozens of times I’ve needed to tie something together. Aside from the many everyday non-emergency situations where cordage comes in handy, it could be your (literal) lifeline in a SHTF emergency. Read these survival uses for paracord and you’ll see why it needs to be in your EDC gear. Chances are that you probably already have some first aid supplies on you. For example, you can easily make an arm sling just by pulling your shirt up and pinning the bottom corner to your shoulder. Most critical first aid doesn’t require supplies so much as knowledge, so take a first aid course ASAP! For EDC though, it is really useful to have supplies like moleskin, adhesive bandages, butterfly bandages, pain relievers, a safety pin or needle, and any meds you might need like an EpiPen. 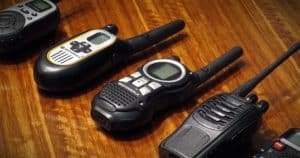 Aside from all of those times that a flashlight helps you get your keys into the lock at night, an EDC flashlight is vital for blackouts, dark alleys, walking over bumpy terrain at night, and zillions of other situations. Sorry, but the flashlight on your cellphone just isn’t going to cut it. Here’s a [email protected] tactical flashlight that you can get from Amazon..
You might have a knife on your multi-tool, but that flimsy knife isn’t enough! A knife is one of the most important pieces of survival gear, so your EDC knife better be sturdy and reliable. Preferably it will be a fixed-blade, full-tang knife. However, a fixed-blade knife might be too bulky for your EDC, so a folding knife is okay too. Read How to Choose a Survival Knife. There are so many EDC multi-tools to choose from that it gets overwhelming. To narrow down the options, make a list of all of the features which you absolutely must have. Then make a list of the features which you’d like to have. These are a new generation of EDC gear. Unlike the bulky Leatherman-style EDC tools, these EDC items are meant to fit in your wallet. Some go on your keychain, but aren’t as bulky as a folding multi-tool. What I love about this type of EDC gear is that it is cheap. If you live in a city, then I’d say your EDC gear better include a pocket pry bar like the one below in case SHTF and you’ve got to get into locked places! For pretty much everyone, this is going to mean a cellphone or smartphone. It’s worth noting that cellphones are VERY unreliable during disasters because of line overload. Make sure you have an emergency communication plan in place! Back in 2014, there was a study which found that 1 out of 10 people don’t carry cash anymore. Nearly half of those who do have cash carry less than $20. A lot has changed in two years, so I imagine the number of people with cash on them has fallen even further. I’m not saying that you should carry wads of cash on you, but it is critical to have some just-in-case money as part of your EDC. Preferably nothing less than $50. 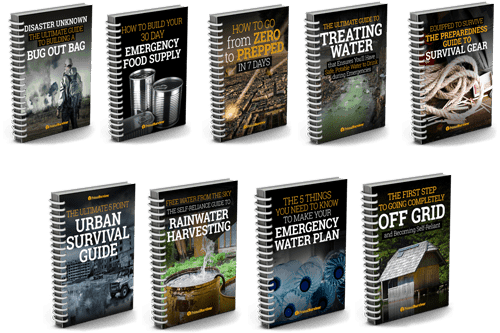 What if a major disaster suddenly struck? The ATM machines (if they were even working) would quickly drain their supplies. 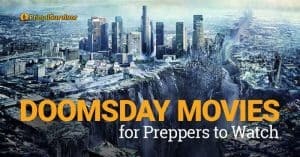 True, cash would be worthless after a huge SHTF disaster – but people wouldn’t realize that until a few days or weeks. Cash would still be valuable for things like supplies or even buying safe passage out of the city (something my Bosnian friends mention in their war survival stories). Here’s a story which illustrates why it is so important to always have your ID on you as part of your EDC gear. In the early 2000s, I lived in a major city with a very high crime rate. I was at work and got a call from a colleague saying that she was probably going to be very late for work. It turns out that a crime had occurred in her apartment building while she was out. The police cordoned off the entire area and weren’t letting any residents through unless they could show ID proving that they lived there. Since she had carelessly left her ID inside, she wasn’t able to get into her apartment until much later in the day. Aside from crazy scenarios like this, there are also 24 states with Stop and Identify statutes that allow police to demand identification. Medical ID: This includes info like your blood type, allergies, and medical conditions you may have. It is very important for people like diabetics and those with epilepsy! Providing fast access to the info could save your life!!! ICE Number: You can program an “In Case of Emergency” number into your phone. First responders and hospitals now know to check for the ICE number so they can contact your loved ones in case of an emergency. Vehicle Documents: When traveling, don’t just keep these in your car. What would you do if your vehicle got stolen? You can make a remote copy to have accessible anywhere. Yes, there is a lot of controversy around whether documents should be part of EDC gear. For example, there are privacy concerns with the iPhone Medical ID app. If you have medical problems like epilepsy though, I’d say the benefits outweigh the risk – but I’ll let you decide for yourself. What EDC gear to you always carry? Let us know in the comments. • Handgun & ammo and conceal carry holster + conceal carry license or copy thereof. Barring a handgun, consider bear/pepper spray or wasp spray or a fully charged taser.• Cash in *small* bills… think vending machine usage or convenience store, do you wanna pay $10 for a half-gallon of milk and a loaf of bread, or $50. • A USB-to-micro USB charging cord. • Slim solar charger. • Couple of carabiners. • Proof of medical insurance… I’m fortunate in that I have Tricare (military) health insurance and only need my DoD card, but others could be turned away in an emergency, or put at the bottom of the triage list without proof of ability to pay. Disposable/refillable lighter. • Lip balm, such as Chapstick… dozens of uses plus it’ll keep chapped lips at bay. 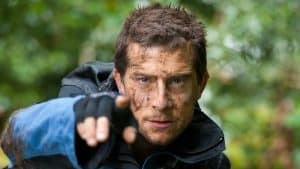 • One of the easiest ways to carry paracord is with a tactical bracelet/lanyard… buy the recommended cordage above and braid yourself a nice bracelet, anklet or lanyard, then wrap as much cordage as you can around whatever gear you’re carrying. • Something to carry it all in… consider a pouch such as the CONDOR Pocket Pouch or the Vanquest EDCM-Husky 2.0 Maximizer (Every-Day-Carry-Maximizer). Quality EDC there TX. Thanks for the bag dump.